Now I ask if Berkeley has withdrawn its welcome mat. 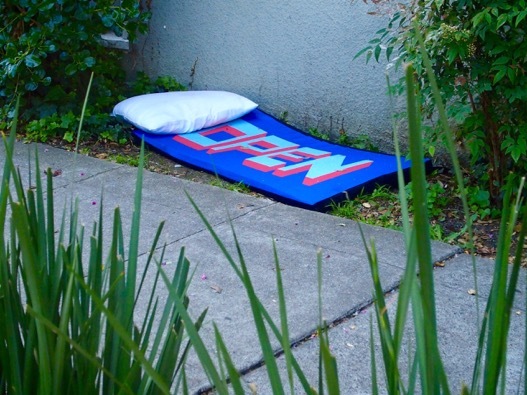 Several years ago Berkeleyans had a chance to roll-up its welcome mat by passing an anti-sidewalk-sitting measure in the general election of 2012. That measure was defeated decisively. 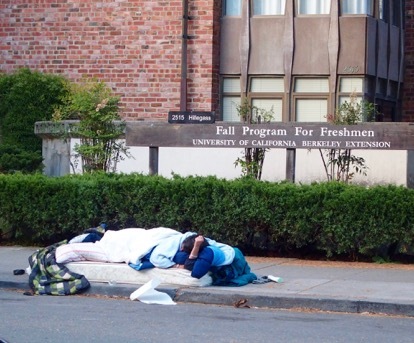 One of the arguments against the no-sit measure was that existing regulations were in place. 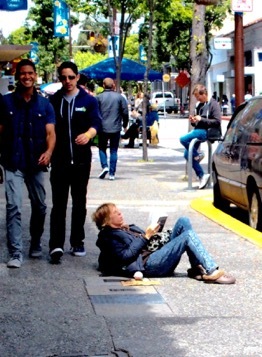 Lying on sidewalks, by day, has always been illegal. Now it appears that lying and sitting are both accepted. Berkeley policing (city and university) is governed by priorities, and cops may have read the voters’ decision to sanction sitting as including lying. Besides, cops have been besieged with more serious crimes, including larcenies, assaults, and murders. 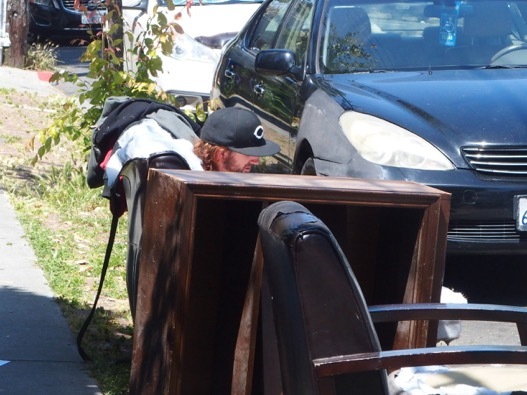 To see the streets in our Southside business districts, you might think street-wise transients, who continue to view Berkeley as liberal, have played the situation by adopting various street-strategies. Chief among such strategies is what we call the splat (for lack of a better term). The splat is a hybrid. Not quite a sprawl and not a sit. This maneuver is accomplished by propping one’s torso on a backpack or bed roll. Another factor in this analysis, is the murky matter of protected zones on Berkeley walkways where police allow splatting, lying, and gear-storage. That this squatters-zone is not based on city codes, but seems rather to be an arbitrary police decision, matters not. If cops allow such squats in designated zones, this makes such zones a reality. Especially on Berkeley’s heavily populated (by liberal students) Southside, you will view Berkeley’s sidewalk sprawl, which includes a good measure of impaired judgement among our ever-present mentally ill.
Demonstrators often reflect the sentiments of Berkeleyans in general and recent demonstrations have sounded the alarm when the claimed rights of our homeless seem threatened. This was the case, last year, when downtown encamped homeless were endangered, leading to a swirl of demonstrations on their behalf. 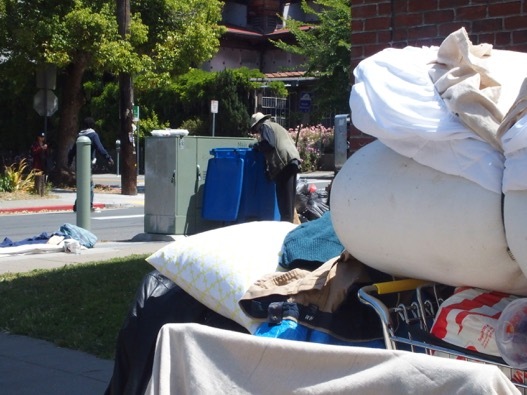 Across the bay, in San Francisco, and other more populous West Coast cities, like Seattle, and Portland, the homeless hordes have formed often intractable intentional communities of tents and makeshift kitchens. 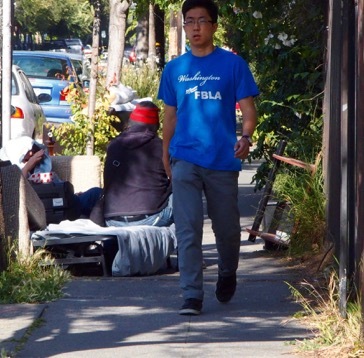 By comparison to these larger cities, Berkeley’s cluttered sidewalks seem a mere glitch. 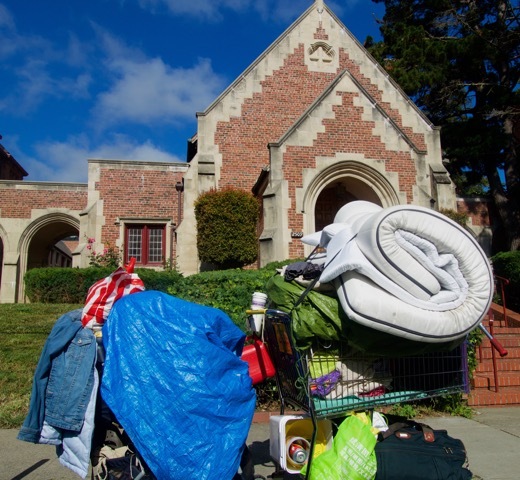 With the foregoing in mind, we can report that, yes, Berkeley is still a Hilton to the homeless. [And in return for borrowing the Hilton name, we acknowledge the Hilton Foundation’s charitable contributions to assist the homeless]. This entry was posted on Friday, May 27th, 2016 at 7:38 pm	and is filed under People's Park, Telegraph Avenue, The Berkeley Scene. You can follow any responses to this entry through the RSS 2.0 feed. Responses are currently closed, but you can trackback from your own site.